What’s the most dreaded task of the day? If you said “making dinner” you’re not alone. 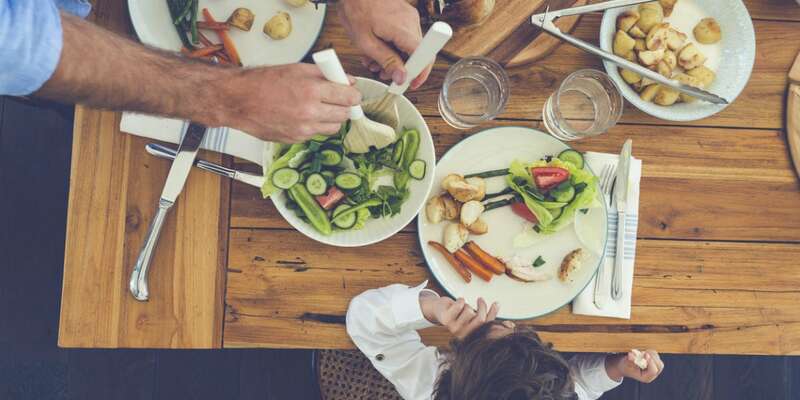 The pressure of what to make and how to get everything prepped and cooked during the after-school/after-work rush can overwhelm even the most organized parent. With meal delivery, you can wipe that worry from your mind—and avoid those last-minute, fast-food drive-through dinners. (We’ve all been there!) The healthy, hearty plates created and delivered by the following services can save you time, stress, and guilt. Prices below are per-person. Grocery delivery service Fresh City Farms also makes and delivers entrées, salads, soups, wraps, breakfasts, snacks, juices, smoothies, and recipe kits made with mostly organic ingredients sourced from local farms. Vegetarians have ample options and meat eaters can feel good about 100% organic beef, chicken, and pork and Ocean Wise–approved seafood. It’s all customizable: mix grocery items with prepared foods, get regular weekly meal delivery for a family of four, or create entirely DIY bags of your choosing for each delivery. On the menu: Swedish meatballs and peas, chicken Cobb salad, black bean burrito bowl, roasted veg and hummus wrap. With years in the culinary field, Today’s Menu’s chefs put their experience towards creating high quality meals for delivery and pick up. Today’s Menu provides meal options for one, two, or four people and curated meal plans for seniors, active families, and working couples. Overwhelmed by choice? Try the Too Busy To Plan menu: 3 dinners that serve 4 for $78. Gluten-free and vegetarian options available. On the menu: Beretta beef burgers, mild jerk chicken, three-cheese macaroni. At eFresh Meals, you can choose a meal plan for 6 to 24 meals per week, selecting your dishes from an extensive list of entrées and sides, breakfast, snacks, and desserts. Or, you can choose your items à la carte, including fresh “family meals”. And for every meal ordered from eFresh Meals, they donate a meal to those in need in the GTA! There are gluten-free, sugar-free, dairy-free, and nut-free options. On the menu: cheese tortellini with pancetta and arugula, kale and chicken Caesar salad, butternut squash ravioli in cheese sauce, blueberry protein pancakes. Every Monday and Thursday, Chowdy’s chefs prepare healthy, fresh meals delivered to subscribers. Each meal consists of an entrée and side and has a balanced mix of proteins, carbs, and veggies. You can choose your meals for the week and delivery begins the week after you first sign up. On the menu: goat cheese and shallot tart with quinoa-pomegranate-chickpea salad, roasted pork leg with pesto and a side of farfalle and carrots, Hungarian beef stew. “Trending” local chefs cook meals to be delivered fresh weekly. New specials are offered every week, in meal plans of 4, 6, 8, or 12 meals per week. Nutrition info, all ingredients, and allergens are clearly labelled for each meal. On the menu: chicken-and-shrimp spinach pesto pasta, spaghetti and meatballs, stuffed peppers with veggies and rice pilaf. For comfort food classics made fresh with seasonal ingredients with the added bonus of being low-fat and low-sodium, HomeStyle is the place to go. You can order breakfast, lunch, dinner, and snacks à la carte (at least three meals per delivery). The menu changes every week and all deliveries are on Monday. On the menu: mac and cheese with crusty roll, turkey meatloaf with broccoli and scalloped potatoes, homemade granola, and Sunday dinner roast with mashed potatoes and green beans. At Green Zebra Kitchen, a new, plant-based, gluten-free menu is created each week. You can order the small plan (three or four lunches or dinner per week) or the large plan (six to eight lunches or dinners per week) or just order à la carte salads, beverages, breads, spreads and condiments, desserts, and snacks. Meals are all vegetarian and vegan. On the menu: tempeh reuben with ruby kraut and cashew cheese, Tandoori mac and cheese, banh mi bowl with Portobello mushrooms, tofu, and miso dressing. If you aspire to clean eating, try a customized weekly or monthly meal plan (twice-weekly delivery) at Athletes Kitchen. Breakfast, lunch, dinner, desserts, and snacks are available and categorized by style: Nu-Paleo (low carb/high protein, with healthy fats), Athletes (more carbs, lean proteins, superfoods), or Shredding (high fibre, lower fat and lower protein). Food is free from table salt, unnatural sugars, and oils other than coconut oil. On the menu: beef bourguignon, tagine turkey, carrot protein muffins, root slaw salad, spinach tomato frittata cups. Owner chef David Greensmith creates gourmet meals (with an option to upgrade to paleo/gluten-free) customized to your health and lifestyle goals. Your own personal web page displays a running total of your account, so you can pick the meals you want each week, and start or stop the service any time. Entrées and breakfast. On the menu: turkey-mushroom meatloaf with parsnip mash, Spanish chicken with salsa verde and wild rice and vegetables, beef meatball on tomato puttanesca with spaghetti squash. Fitness trainer and Fit Organix founder Jules Lieff started the daily meal delivery system out of concern for her clients’ eating habits. Her Fit Organic products are free of gluten, dairy, soy, corn, and peanuts and are included in her Regular, paleo-like, and vegan meal plans. Providing breakfast, lunch, dinner and snacks, Fit Organix also sends its customers a daily menu email with nutritional information. On the menu: Buddha bowl with roasted and raw veggies, grilled flank steak with mushrooms and peppers, protein breakfast cookies with vanilla-coconut yogurt. Well-known delivery service Grocery Gateway also delivers meals. Providing single-portion meat pies and quiches, entrées and soups, burritos, pasta, and more, most meals need to be heated and some are packaged as a meal ready-to-cook. They also deliver sandwiches and have paired with Weight Watchers to provide fresh recipe meal kits (ingredients with provided recipes) for two to four people. On the menu: breaded veal cutlets with sauce, teriyaki trout with Baja vegetables, chicken noodle soup, asparagus and Swiss quiche. Honey Bee Meals sends a scheduled meal delivery to your home every Sunday and Wednesday, for a week of hand-crafted, gluten-free, soy-free, dairy-free, and refined-sugar-free fare. (No canola oil or vegetable oil, either.) The weekly menu is pre-determined by owner Amy Sherman, a holistic and sports nutritionist and trainer. Produce and meat are local and largely organic; fish is Ocean Wise and wild-caught. Breakfasts and snacks are available, too. On the menu: spaghetti squash casserole, Cajun salmon with brown rice and pico de gallo, turkey zucchini popovers with potato wedges and kale. Fuel Foods claims to deliver “balance, fitness, nutrition, time, and value…[and] results.” The owners and co-founders both have more than a decade of experience as personal trainers. They take their experience of “getting results” and put that into delivering food that they claim is “not only healthy, but delicious.” Vegan options are available. In addition to entrées with sides there are breakfasts, snacks, salads, and juices. On the menu: couscous tabbouleh with tofu, mushroom penne, panko Parm chicken breast with cider-dressed green beans. Rose Reisman is a registered nutritional consultant and pundit who recently published her 19th cookbook. Personal Gourmet prepares calorie-controlled meals (choose from 300, 500, or 800 calories per meal) for delivery as many days per week as you choose. Go for à la carte options delivered frozen each week (dinner, lunch, breakfast, snacks) or opt for a meal plan based on your health and fitness goals. Or try the fresh (not-frozen) meals for four. On the menu: old-fashioned beef brisket with roasted potatoes and sautéed mushrooms, pulled pork wrap with barbecue sauce, split pea soup. SupperWorks is best known for its in-house meal assembly kitchens where you can make a week’s worth of freezable family-size entrées. But it also delivers prepared meals. You start by choosing your meal and sides online, just as you would to make the meals in-store, then you choose to have Supperworks prepare and deliver them. At least six entrées must be ordered and delivery must be scheduled a week in advance. Vegetarian options are available, plus desserts, sides, and smoothies. On the menu: baked pasta Florentine, beef-and-barley stew, cornmeal-crusted haddock with pineapple salsa.